Renewable Agriculture and Food Systems now operates a double-blind peer review system. 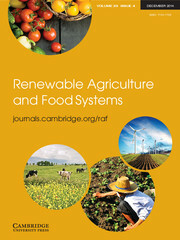 Renewable Agriculture and Food Systems (formerly American Journal of Alternative Agriculture) is a multi-disciplinary journal which focuses on the science that underpins economically, environmentally, and socially sustainable approaches to agriculture and food production. The journal publishes original research and review articles on the economic, ecological, and environmental impacts of agriculture; the effective use of renewable resources and biodiversity in agro-ecosystems; and the technological and sociological implications of sustainable food systems. It also contains a discussion forum, which presents lively discussions on new and provocative topics.